Ferocious hits and why we love and hate them ruled the news cycle this past week, even putting BrettFavre’s silly text message scandal on the back burner. Four different examples of defensive players absolutely blowing up defenseless receivers all within a span of a few minutes in three separate games last Sunday spurred the debate, which seemed to end with the NFL declaring that some big hits deemed to be illegal could now potentially result in suspensions. I say seemed to end because it actually didn’t end there – it just got started. Steelers LB James Harrison Lays Out Mohamed Massaquoi. 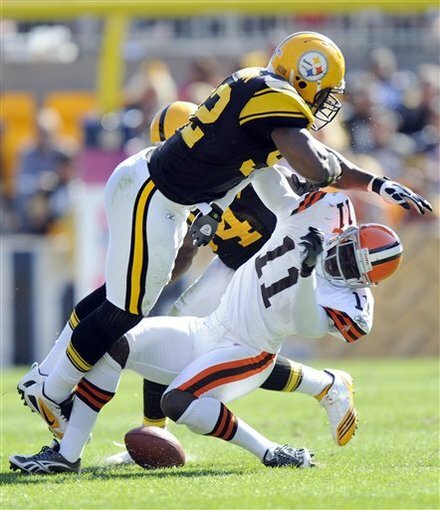 Pittsburgh’s James Harrison was fined $75,000 for blasting Cleveland’s Josh Cribbs and then Mohamed Massaquoi in the head helmet first (probably an excessive amount since the hit on Cribbs appeared to be legal regardless of the fact that the one on Massaquoi decidedly was not). Atlanta’s Dunta Robinson was rung up for $50,000 for his blast on Philly receiver DeSean Jackson (an insane ruling seeing as how Robinson didn’t lead with his helmet or hit Jackson in the head). And finally, with the most egregious, brutal of the hits, the Pats Brandon Meriweather lost $50,000 for his unconscionable spearing of Baltimore’s Todd Heap, a play that seemed to have even the toughest, most defiant of NFL commentators crying foul. But none of the three were suspended, despite the fact that the fines came down the day after the NFL announced that such a penalty would now be considered. The reaction was predictably mixed with players both past and present almost universally protesting the league’s mandate while writers, TV talking heads and other assorted non-players were generally in agreement. The league’s rationale was that any more severe punishments for penalized or illegal hits was that of player safety while those in disagreement argued that it’s impossible to change the way you’ve been taught to play the game since Pop Warner and that hits, no matter how big, are a part of the game. The league trying to legislate big hits out of the game, they said, is not only detrimental to the product and how the players play but hypocritical given how the league has always sold big hits as part of its overall marketing strategy. The bottom line seems to be that both sides have a point. The last thing the NFL wants is for a player to be severely injured, paralyzed like former Pats receiver Darryl Stingley was in 1978 or worse, killed on the field. Players are as big, strong and fast as ever and whether they are trying to or not, flying through the air at full speed before crashing into another player in no position to brace himself for the incoming hit is something that can and does happen with regularity. On the other hand, the players who have protested are right that the game is violent, they were all taught to play a certain way and that things they have willingly signed up for may well happen. It seems that if the league is really going to follow through with its plans to hand out harsher penalties for these hits, it should wait at least until training camp next year so that the players at least have some time to adapt to the changes as opposed to needing to make them on the fly in the midst of a season. There is probably a happy medium somewhere that can be agreed upon by all parties involved. But if the NFL higher-ups think that just by sending a tape around to each team demonstrating what’s legal and what isn’t and threatening suspensions to those who don’t/can’t/won’t step in line will eliminate hits like the ones doled out by Harrison, Robinson and Meriweather, they are undoubtedly mistaken. 1. Pittsburgh: Feels slightly itchy to award anything to the Steelers in the wake of the pageantry awarded the disgusting Ben Roethlisberger upon his return from suspension as well as the “woe is me,” whining and drama queeny retirement threats by linebacker Harrison after his fine for nearly decapitating Massaquoi in last week’s win. But personal feelings aside, there’s no evidence to suggest these guys – one minute from being 5-0 – aren’t the best team in the NFL right now. Their next four weeks – at Miami, at New Orleans, at Cincinnati, vs. the Pats – will determine their fate for this year. 2. New York Jets: This one itches even more especially considering everyone’s favorite Prius eater Rex Ryan’s contention that being 4-1 obviously means, “it’s hard to say we’re not the best team in the league right now.” Actually, Rex, what’s hard to say is that you ARE the best team in the league right now. There is no doubt that the Jets are very, very good and winning in Denver despite not playing even close to their best game said a lot. They should contend all year. But why do they (and by they, I mostly mean Ryan) have to constantly remind us of it? 3. New England: It may seem a little bit high, especially given the ongoing crapiness of the defense (opposing quarterbacks are completing passes against the Pats podunk secondary at a 71 percent clip). But still, they are one lousy half in New Jersey from being 5-0 and in this season of medioc…um… ahem, I mean parity, being one of the final three teams with just one loss goes a long way. 4. Baltimore: The Ravens seemed to have last week’s game in Foxboro wrapped up until the Pats blew up in the fourth quarter. But they were somewhat complicit in their own demise as they went super conservative on offense down the stretch which played right into the Pats hands. When you have as much talent on that side of the ball as the Ravens, there’s no reason to start dinking and dunking for three and four yards a pop, especially against as vulnerable a defense as the Pats. 5. (tie) Indianapolis/New Orleans: The Colts pulled it out against the Redskins despite losing Joseph Addai, Austin Collie and, perhaps most importantly, Dallas Clark. Will be interesting going forward to see how much these losses affect Peyton Manning. As for the Saints, they looked far more normal against the upstart Bucs with Drew Brees hitting 263 yards and three big TDs. What was really impressive though was New Orleans getting their running game going behind backup Chris Ivory, who piled up 158 yards on only 15 rushes. 1. Buffalo: The best thing to happen to the Bills (and the rest of us) this past week? They didn’t play. Not too much can go wrong under those circumstances, even when you’re the Bills. 2. Carolina: See above, although the Panthers’ somehow still employed coach John Fox made the call to go back to initial starting QB Matt Moore for this week’s game against San Francisco over no chance rookie Jimmy Clausen. That was newsworthy, at least in so far as you rarely see coaches publicly admit it when they make massive errors in judgement. I guess when you know you won’t be in the same place in a year, making rash, impulsive decisions then going back on them three weeks later isn’t such a big deal. 3. San Francisco: So the 49ers actually won a game. Who cares if it was against the wildly unpredictable Raiders? A win is still a win, especially when stars like Frank Gore run for 149 yards and receivers Michael Crabtree and Vernon Davis find the end zone. Now, with the Panthers up next (my god, what an awful game that should be) and their next four games after that against the Broncos, Rams, Bucs and Cards, the Niners may well find themselves back in the hunt for their division. 4. (tie) Oakland/Cleveland: The Raiders, who won a huge division game against the Chargers in Week 4, couldn’t be bothered to show up against the reeling Niners, losing 17-9 and blowing a chance to reach .500 this late in the year for the first time since their last Super Bowl season in 2002. It can’t have helped that quarterback Jason Campbell, who owner/Skeletor lookalike Al Davis compared to Jim Plunkett in the preseason, had a 10.7 passer rating (lower than the woeful JaMarcus Russell ever posted) and presided over five straight three-and-outs at one point. As for the Browns, they still look halfway decent for a one-win team. Rookie quarterback Colt McCoy not only wasn’t scarred for life against the ferocious Steelers, he actually completed 70 percent of his passes for 281 yards and a TD. He’ll deservedly start again this week in another likely loss for Cleveland at New Orleans. 5. Dallas: Perhaps the Lions should be here instead of the Cowboys, but when you can’t play a game without committing double digit penalties, turning the ball over multiple times or forcing any, you are what the Cowboys are, which is 1-4. 11 more infractions for 91 more yards, including getting a long TD pass and a big punt return called back in their loss to the Vikings. Another long kickoff return given up, this one for a TD. Another celebration penalty in the end zone. Two more huge Tony Romo picks. It doesn’t matter that they are third in total offense and fourth in total defense. They are first in penalties and penalty yards and coach Wade Phillips can’t or won’t fix it. He won’t get fired though – if he does, Jerry Jones may not have as easy a time pretending he’s coaching the team himself. – Kevin Kolb, Eagles: After being named the Eagles starter then getting benched after one half and a concussion, Kolb got back on the field two weeks ago and has put up passer ratings of 103.3 and 133.6 in consecutive wins. Last week against the Falcons, he was a whopping 23-for-29 for 326 yards and three TDs in a big win. It will be fun to see how Eagles coach Andy Reid screws up this situation again when Michael Vick gets healthy but for now, Kolb is the man. – Mike Williams and Deon Butler, Seahawks: In their first game of the post Deion Branch era in Seattle, these two young receivers really stepped up in a road win over the Bears. Williams, the former first-round bust in Detroit, had 10 catches for 123 yards and Butler, a second year man out of Penn State, had four catches and a TD. – The Rams and Dolphins Defense: Hugely impressive performances for both these groups, each in a big win. The Rams, now an astonishing 3-3, beat the Chargers and their No. 1 ranked offense 20-17, racking up seven sacks and holding San Diego to just 287 total yards. Defensive lineman Chris Long, the second pick in the draft a couple years ago as well as the son of Hall of Famer Howie Long, had two of those sacks and became the first Ram to be named Defensive Player of the Week in over two years. The Dolphins held the injury depleted Packers to 20 points on the road in an OT win with second year defensive end Cameron Wake registering three of his team’s five sacks, giving him six in five games. – The Chargers: The Chargers never start playing that well until late October/early November anyway, but that may not happen given all of their problems so far this season. The loss in St. Louis made them 0-4 on the road so far this year and headed into this week’s showdown with the Pats, they’ve lost nine fumbles, had three punts blocked and allowed six returns for TDs (punt, kickoff, INT and blocked punt). – The Bears: The most fraudulent team with a winning record in the league, the Bears were 0-for-12 on third down in the loss to Seattle and now inexplicably haven’t converted a third down since Week 3. Their putrid offensive line let already banged up QB Jay Cutler get sacked five more times. It doesn’t help that Cutler holds on to the ball far too long but if the line doesn’t start blocking someone, anyone, he won’t last the season. – The Chiefs, Redskins and Texans Defense: The Chiefs/Texans game last week was a pure shootout, ending in a 35-31 Texans win in which they scored 21 points in the fourth quarter to pull it out. For Romeo Crennel’s D, so impressive against the Colts the previous week, those 21 points were more than they’d given up in any full game so far this year. And the Texans, already bad on that side of the ball, let the Chiefs run for 228 yards at six yards per attempt while also allowing Matt Cassel to complete 70 percent of his passes and throw for three TDs. As for the Redskins, one of my trendy picks last week, they gave up 470 yards to the Colts in a tough home loss and are now dead last in the league in total defense (420 YPG). Ouch. Um, earth to Jack? You’re the head coach, right? You have final say over everything, do you not? If you didn’t like the way things were going during that drive, why didn’t you say or do something about it? Why did you wait until a press conference two days later and then throw your offensive coordinator or play caller or whomever under the bus instead of taking responsibility for your team and your staff, the way a head coach should do? Could it be because you think you may be in danger of losing your job because your team stinks, having done nothing but careen straight downhill (15-23 the past two-plus years) since losing to the Pats in the 2007 AFC divisional round of the playoffs? Or were you just embarrassed that your team, having somehow won two in a row, decided not to show up for a nationally televised home game against a division opponent and subsequently got the crap kicked out of it? This lack of accountability on your part says a lot, primarily that you are a fraud, a finger pointer and a mediocre (at best) coach. Really, can you imagine Belichick doing/saying anything like that (or, on another note, saying anything)? Shirking responsibility for his team’s failures while simultaneously attempting to blame one of his assistants in the process? Never. Not in a million years. When the Pats lose or don’t do something well, Belichick immediately takes the blame for the entire collective staff, without fail. He doesn’t try to weasel out of it by implicitly humiliating one of his assistants in front of the press. Maybe that’s one of the many reasons why he’s 116-49 with three championships with the Pats and 152-93 overall in his career while Del Rio is just two games over .500 in an eight year run with the Jags and presides over a perennially last place team. Del Rio has been in the news for the wrong reasons more than once in his time, from claiming he thought a play on which one of his defenders speared Tom Brady after the whistle with Brady already on the ground in a 2006 game was a legitimate hit then indirectly saying Brady deserved it, to having his owner call him out at the end of last season for “the way he treats people, his work ethic, his involvement in the community and the direction of the franchise.” Now it appears we can add another item to the list. Classy stuff. Another great read as always.